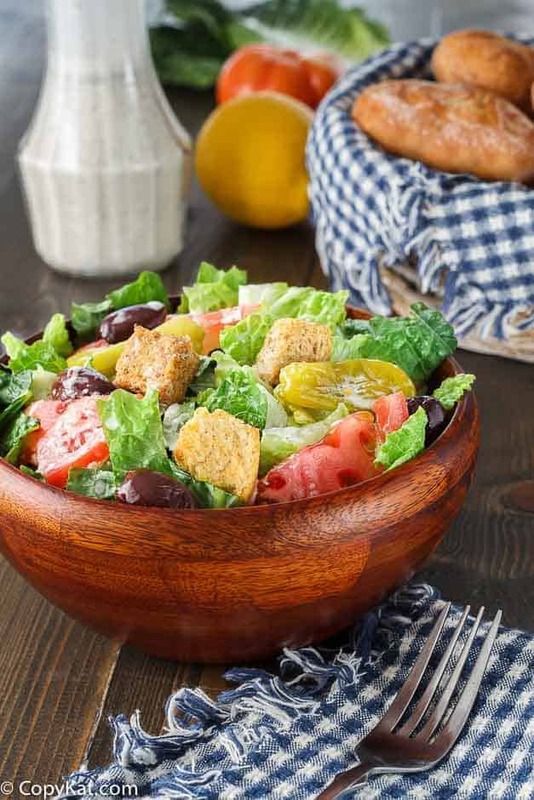 Home » Copycat Restaurant Recipes » Olive Garden Salad Mix – use our recipe, and make this at home. Olive Garden Salad Mix – use our recipe, and make this at home. Olive Garden Salad is one of the best things about the Olive Garden. The Olive Garden salad is so fresh and made up just for you. You can make the Olive Garden salad at home; we will show you how. It is easy to make a salad just like the restaurant’s. Have you ever wondered how to put together this famous salad? It is relatively easy to prepare this salad. I like to use a bag of American salad mix to start with, but then you need the special ingredients. What makes this salad special? It is all of the wonderful extra ingredients in it that make is extra special. I don’t know about you, but when grew up eating salad at home, we would add tomatoes, and if we were fancy we would add some sliced cucumber. Pitted black olives add the right touch to this. I usually have a can or two of these black olives on hand. For the peppers, you have a couple of choices. If you like the peppers hot, add pepperoncini. If you like those peppers mild, you could use banana peppers. Red onions make this salad special. Slice your red onions very thin. When red onions are freshly sliced they can be a little hot, the air oxides them and takes away the heat. You will want your salad piled high with croutons. If you have some leftover bread, you could always toast up the bread and make them fresh. Finally, don’t forget the Olive Garden salad dressing. The salad dressing is sold everywhere now, or you can make your Olive Garden Salad dressing with this copycat recipe. Do you know to know what is in the Olive Garden Salad? Unlock this secret. Chill your salad bowl in the freezer for at least 30 minutes. Empty the bag of salad into the bowl. Top the salad with the onion, olives, pepperoncini, croutons, and tomatoes, and croutons. Add some freshly grated cheese, if you like. Add plenty of Olive Garden salad dressing and mix well. Serve immediately. This is like Olive Garden salad now. They use to have artichokes in the salad best part. I never cared for Italian dressing until I had this salad. How much dressing from the store do I use on a lg bag of lettuce??? What dressing do you use, since they have so many of Olive Garden!!! I want the same taste as they do!!! what about the chicken they add to their salads…do you have a recipe for that:? Oh, disappointed, I was looking for the recipe for the SALAD DRESSING, not the veggie/lettuce ingredients. I just made the dressing. Here is the recipe. Mix in blender for 30 seconds then chill for 1 hour.